Netflix provided ComingSoon.net the chance to speak with star Mads Mikkelsen and director Jonas Åkerlund about their adaptation of the graphic novel Polar. Check out the interview in our player below! Directed by renowned Swedish director and drummer Jonas Åkerlund (Lords of Chaos) with the screenplay written by Jayson Rothwell (Silent Night), Polar is based upon the Dark Horse action noir graphic novel Polar: Came From the Cold by Victor Santos. The world’s top assassin, Duncan Vizla (Mikkelsen), aka The Black Kaiser, is settling into retirement when his former employer marks him as a liability to the firm. Against his will, he finds himself back in the game going head to head with an army of younger, faster, ruthless killers who will stop at nothing to have him silenced. The action, mystery and intrigue will be set entirely to a custom body of menacing productions by deadmau5. The Constantin Film/Bolt Pictures co-production, in association with Dark Horse Entertainment stars Mads Mikkelsen (Doctor Strange, Rogue One), Vanessa Hudgens (Spring Breakers, Beastly), Katheryn Winnick (Vikings) and Matt Lucas (Alice In Wonderland, Doctor Who). It is produced by Constantin Film’s Robert Kulzer (Resident Evil franchise), Jeremy Bolt (Resident Evil franchise, Death Race), Hartley Gorenstein (Room) and is Executive Produced by Constantin Film’s Martin Moszkowicz, Mads Mikkelsen, and Dark Horse Entertainment’s Mike Richardson and Keith Goldberg. Netflix will release the film globally on January 25, 2019, excluding Canada, Germany, and China where Constantin Film will be handling distribution. 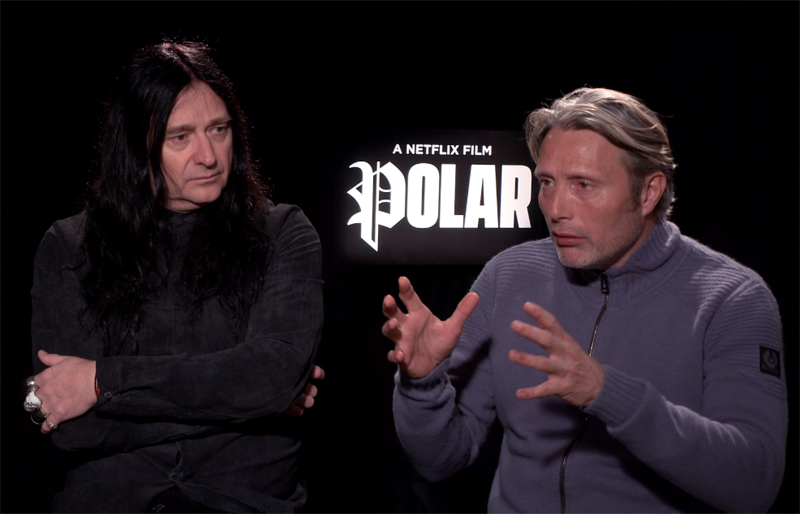 The post CS Video: Mads Mikkelsen & Jonas Åkerlund on Netflix’s Polar appeared first on ComingSoon.net.